My treatment began with a consultation with Expert Therapist Julie Thomas (and that title is there for a reason, Julie is insanely knowledgeable in all things beauty). She wanted to know my skincare concerns and desires to best tailor my facial. She then did a skin analysis which involved me sticking my face inside a high-tech camera. My face was then photographed and the image sent to a connected computer for analysis. The computer analysed every inch of my skin, examining everything from sun damage and pigmentation to ageing and texture. The consultant then went through the results thoroughly, advising me on how best to treat the parts of my skin that are not in great condition. The result of this analysis was also important in determining what treatments and products she would include in the facial. The facial involved many of the steps you'd expect (deep cleanse, exfoliation, mask etc.) however unusually (but amazingly) it featured an extraction - which sadly feels like a dying art in today's beauty world. I love a good extraction as it guarantees complete removal of all the nasties lingering in and around my skin. Popping spots and removing blackheads is never worth doing yourself as it can lead to further permanent skin damage, so getting a pro to do it for you is a real benefit. I believe extractions are so crucial that I won't ever have a facial at a spa or clinic that doesn't offer one as standard. So good on your D.Thomas! The rest of my facial involved a little pain-free laser to remove two little broken capillaries around my nose, as well as the peel itself. Unlike other peels I've had in the past, the active mask (the 'peel' product) was designed to stay on my skin for a number of hours before being gently removed in the evening. I expected irritation and itching for the rest of my day but I couldn't be more wrong. I experienced no irritation on my skin and had no problems cleansing in the evening. Now I wouldn't stay the facial was uber pampering. However it wasn't supposed to be - it was designed to correct and improve the skin not comfort it, after all. As far as I'm concerned, the more relaxing and pampering a facial, the less noticeable improvement it's actually going to give your skin. This was the most intense peel I've ever had and it was also the least painful and irritating. The extraction was a little on the painful side as, at the time, my skin was badly congested, however the peel itself caused very little irritation during or after the treatment. I did experience some flaking skin around the mouth and eyebrows a few days after the treatment, however I was pre-warned about this so was prepared for the peeling! Once the peeling finished, my skin looked better than it has looked in a very long time. It was bright, spot free and unbelievably smooth. The two capillary lines that were removed from my nose also made a world of difference! If you have a skin concern, I really recommend paying D.Thomas a visit. I've never known a clinic to create such bespoke facials. My therapist was hugely knowledgeable (about all aspects of beauty), incredibly friendly and nothing short of a miracle worker. 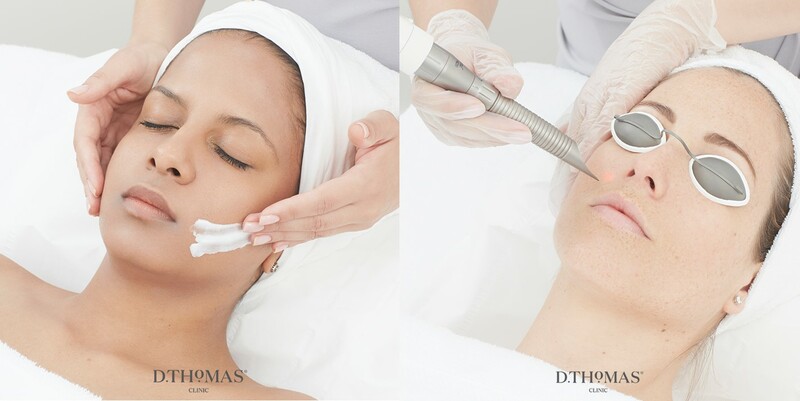 In addition to bespoke facial treatments, the D.Thomas Clinic offers a wide range of treatments, ranging from laser hair removal and skin tag removal to laser lip plump. I received the DNA Essential Skin Treatment, which starts at £95.00.